The Mazda Miata wins awards constantly. Everyone loves the Miata, and the motor press showers it with awards for any reason they can think of. However, the New England Motor Press Association, (NEMPA) has an annual Winter Testing event during which it hands out awards for convertibles. Technically, the award was for its performance at the Ragtop Ramble, but we think it is perfect that the Miata trophy was handed to Mazda at the Winter Testing ceremony. Torque News was one of the first publications to conduct winter testing of the new generation, ND, Miata. In February of 2016, we tested the car at -11 F and then dropped the soft top and went for a spin in a snowstorm to see how the Miata handled in the white stuff. "Splendidly" was the surprise answer. We noted that the car was predictable in its handling and that the traction control did a great job helping the Miata hook up on snow-covered roads. You can check out the full report to hear how well the Miata handled after we shut off the stability and traction control. If you are a Miata fan, you will note that the soft-top isn't the trim that won this year's award, Rather, it is the Miata RF retractable fastback version. 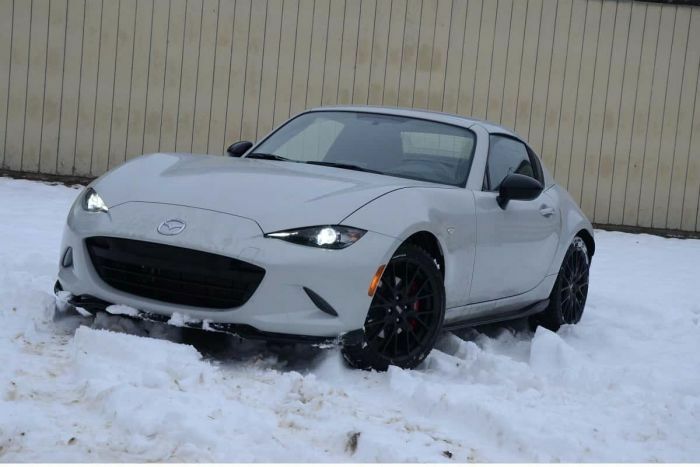 Just to be sure that the RF was as good or better than the soft top, our Senior Editor, Patrick Rall took the Miata for a drive on the highway - in a blizzard. Hey, we take our jobs seriously, what can we say? Rall also dropped the hard top to see if snow would enter the cabin while he was moving. Check out his detailed report for the result. The Mazda Miata in all its forms is a 4-season car if you want it to be. Many owners take special care of the Miatas they own (I count myself among one of those). Do so, and your Miata will look like new even after 25 years. However, if you want to drive a Miata in the snow, we've fully tested it and can tell you it is great. Don't forget to add a set of Blizzak winter rubber, and if you are feeling adventurous, drop the top in the snow like we do. Top of page image courtesy of Patrick Rall.